Over the past few years, the cryptocurrency markets have seen significant and unprecedented growth, with investors in the space earning huge profits. One major drawback, however, is that trading cryptocurrencies is a bit complicated and the recent influx of new projects into the market is quite overwhelming. As a result, investors that do not have the time, resources or expertise to do exhaustive research may end up making snap judgements and losing money. As such, it has become particularly important for investors to be cautious while making investments in ICOs and cryptocurrencies in general. This is because a large proportion of investors lack the knowledge to dissect projects, analyse teams or even to ascertain the authenticity of the claims made in the white paper. More so, even if these investors have the knowledge and expertise to analyse and make risk assessment for blockchain projects they may lack the time, resources, and in depth research required to make informed decision. On the other hand, there are multiple genuine cryptocurrencies and ICO projects that have viable products, and world class teams that have the ability to execute the vision and deliver revolutionary solutions within the space. Here is the deal my friend! Crypto Market Cloud is building a first of it’s kind blockchain, self contained ecosystem, complete with a own blockchain, cryptocurrency exchange and crowdfunding platform that will Ensure that the future of your investments is safe, a solid Return on investment and your investment won’t depend on speculation, marketing, fomo or shilling but rather on good, genuine and honest business practice. 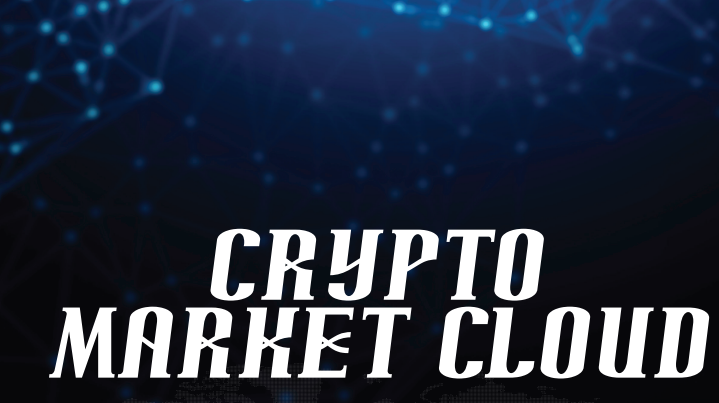 ABOUT CRYPTOMARKETCLOUDCrypto Market Cloud is building a first of it’s kind blockchain, self contained ecosystem, complete with a own blockchain, cryptocurrency exchange and crowdfunding platform. The CMC Ecosystem has been designed and developed with the investor in mind, when investing in CMC you will be part of all its products and part of the whole Ecosystem, all revenues, profit shares will benefit the investor. 5% of the every company that join’s the CMC Ecosystem, 20% of every network transaction, percentage in CMC ecosystem based on your investment and revenue based on your investment. Crypto Market Cloud is already a developed and working product. The team of CMC is trying to build a full self-contained ecosystem. The Cryptocurrency Exchange of the platform will only accept and focus on token generation and listing for Security and Equity tokens. You can start by creating your security or equity token on the platform’s blockchain. Every time a token has created a total of 5% will be reserved for the original CMC token holders. After this, your STO will be listed on the platform’s Crypto Market Cloud for fundraising. During this cycle, the platform will promote your STO to all the subscribers with the help of all the media channels. Once you are successfully done with the funding round, a guaranteed exchange listing will follow on native Crypto Currency exchange. CMC is built on the advantages of an ICO in order to create an ecosystem that is going to bring the next big change in the global capital markets. CMC will enable decentralization of pre-seed investments by adopting unique capabilities of blockchain technology and also by providing a legal way to purchase security tokens. Tokenization of existing assets, creating of a total of 5% which will be reserved for the original CMC token holders with revenue streams, or other hybrid security tokens. The mission is to create your own ecosystem, where investors are protected and benefit from every service CMC and the Company has all services in one place, starting from making tokens, releasing ICO / STO platforms and launching on the exchange. Majority of investors 92% to be almost precise have lost money, the total market cap went from 820 Billion to bellow 200billion, some will say it was fud, others will say bear market and the really savvy once will insist it was a mix of both, and we at Crypto Market Cloud agree with both but also have to ad that, everybody bought into the promises of moons and lambo’s, Promises that companies will disrupt and decentralize this, that and the other. Some companies; months even years since their respective ico end and launch on exchanges, are yet to deliver the promises they made! What does the investor have out of the deal? shilling, but not to educated business practices. Ensure that the future of your investments is safe, a solid ROI (Return on investment) and your investment won’t depend on speculation, marketing, fomo or shilling but rather on good, genuine and honest business practice. Crypto Market Cloud has a clear vision, of what product it wants to develop, how to implement and create usability, with legitimacy and fair business practice. Furthermore we know exactly our strategic position and importance in the industry. for Security and Equity tokens. To decentralize the provisioning of CMC services, migrating from a global infrastructure operated by a small group of hyperscale service providers to a blockchain-based peer-to-peer infrastructure operated by millions of small individual providers and contributors of CMC resources. To simplify the use of professional CMC services for all levels of web users turning such services into a commodity product that is universally accessible and utilized by the general public. To monetize the new decentralized CMC services ecosystem with a dedicated cryptocurrency governed by a smart contract enabling automated and trusted reconciliation of payments between all peer-to-peer CMC services providers. The Company has already achieved the first milestone by establishing its simplified provisioning and setup of CMC services that can be easily operated by even the most novice web users. 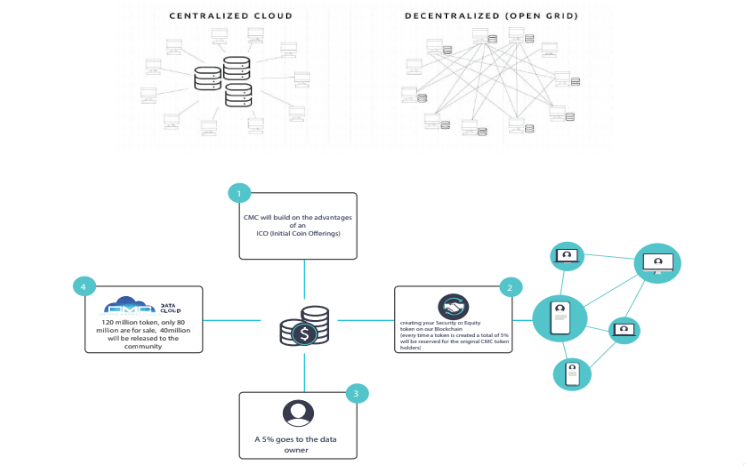 As a second phase, Crypto Market Cloud Eco-System intends to facilitate the creation of a globally decentralized CMC hosting grid, allowing CMC-based applications to automatically scale across millions of CMC service providers who are in fact individuals contributing small portions of their redundant home/oice computer resources to become a part of the block chain Crypto Market Cloud grid (thus eectively creating the new CMC) and benefiting from continuous Provider income. The blockchain Ethereum-based Crypto Market Cloud TOKEN is intended to become the standard currency for the emergent decentralized Crypto Market Cloud services ecosystem, governing contribution based prorata payments, clearing and distribution of financial benefits to the new role players of the CMC. CMC will build on the advantages of an ICO (Initial Coin Oerings) to create an ecosystem bringing the next big change in the global capital markets. CMC will enable decentralization of pre-seed investments by adopting unique capabilities of blockchain technology and providing a legal way to purchase security tokens, tokenization of existing assets, creating of a total of 5% which will be reserved for the original CMC token holders with revenue streams, or other hybrid security tokens. The functioning of CMC ecosystem will be powered by the CMC utility token. The token holders will have priority rights to participate in the initial security tokens launched on the CMC platform in addition to other privileges. The token will also serve as a payment for all related services for the issuance within the ecosystem. Therefore, investors and businesses will be using the CMC token. The creation of token on our Blockchain will provide users the benefit of the use of the whole ecosystem but not limited to use only, however listings a guaranteed and included in the price if the full service is used. This way the decentralized CMC in combination to the user-friendly application/marketplace will create an ecosystem that will be self-sufficient. Not relying on any external factors is of utmost importance for the success of the project and the tokensale. For the fact that a decade of QE and other macro-economic factors, the market is shifting investments from the public markets to private markets. Both because there are less IPOs and because high returns are found more in the early stages of companies rather than when they go public. This means that there is INCREASED DEMAND TO INVEST IN PRIVATE EARLY STAGE COMPANIES SECURITY ICOs. The Security ICOs can be a supplier for this real demand. Private investors that are not participating due to regulatory fears, will step in once there is a way to invest without this uncertainty. Security ICOs can be a supplier for this real demand. Private investors that are not participating due to regulatory fears, will step in once there is a way to invest without this uncertainty. The name of the Token is CMC. Token is the standard Utility ERC 20 token that is currently built on the Ethereum network and can do all the other standard ERC20 tokens. Just like any other blockchain platform, Crypto Market Cloud is known to benefit from its own auxiliary tokens. These tokens are used for various purposes within the boundaries of the platform. If you have further interest in learning about CRYPTOMARKETCLOUD , I have provided links below for you to view.